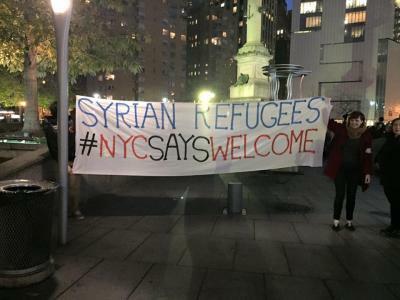 Very refreshingly, the pro-Assad psuedo-left sectarians who usually dominate left-wing street rallies in New York were sidelined, reduced to standing in a small cluster away from the stage with their mass-produced placards. The core group of organizers who controlled the stage (actually the pedestal of the Columbus statue, using the "human sound system" popularized by the Occupy protesters) was made up of young women of Arab and Muslim background, mostly wearing the hijab and keffiyeh. The rally won coverage in the Daily Mail's round-up of outraged reactions to Trump's media-amplified ugliness. See photos here. The rally was immediately followed by a "Chanukah-in-a-Mosque" celebration sponsored by a new group called the NYC Muslim Jewish Solidarity Committee, held at the East 55th Street masjid of the Islamic Society of Mid Manhattan, presided over by Rabbi Burton Visotzky, director of interreligious dialogue at the Jewish Theological Seminary and the Islamic Society's Imam Ahmed Dewidar. Attendees brought donations of food and clothing to be distributed to Syrian refugees in the metropolitan area through the Church World Service. There was excellent couscous, hummus and moussaka on hand, although no latkes. The Muslim Jewish Solidarity Committee website states that their mission is to "take joint public stands against hate crimes, incitement or discrimination directed at either community... By promoting social interactions and knowledge, we are fighting against islamophobia and anti-semitism within our respective communities."